This recent news from Harvard is a perfect fit for the IBBio course, connecting lots of what we have learned in the course. Watch this short TED Talk from Prof. Doug Melton on how they are using stem cells to create new insulin-producing beta cells. Then read this article from the Harvard Gazette on the most recent developments in their work. Goal: Produce a poster, blog post or short presentation to communicate Melton’s team’s breakthrough, including connections to the IBBio course. Role: You are science communicators. Audience: Your peers – high school students and teachers. Scenario: Stem cells and diabetes are both headline-grabbing stories. As we develop more treatments for diseases using stem cells, the public need to be well informed of the reality of what is happening – and inspired by the future. Product: Large visual poster, blog (500 words with media) or short presentation (4-5 mins). Outline the usual treatment needed for type 1 diabetes. Outline the properties of stem cells. Explain how stem cells differentiate to become differentiated cells. Describe the work of Melton’s team to create beta-cell lines derived from stem-cell lines. Outline the proposed treatment for type 1 diabetes through implanting the newly-produced beta-cells. Discuss any caveats or limitations to the method. Discuss any ethical implications for the use of stem cells in this manner. Define any new or technical terms used (or discovered in your research) for the audience. Distinguish between type 1 and type 2 diabetes. Evaluate whether this method would be as effective for type 2 diabetes as for type 1, with reasons. This could be used to teach part of the homeostasis topic once students know about stem cells, or as a review tool for later in the course. Students should refer to the subject guide to check their use of terminology and to regulate the depth of explanation. I’m looking forward to seeing the series! Wow. Here’s Jack Andraka’s TED Audition for a talk on his work developing a carbon nanotube and antibody-based test for pancreatic cancer. Read more about him, his work and the work he built it on here on Forbes.com. *Yup – you can have a go too. I wonder what would happen if a young orangutan asked this adult for a light? 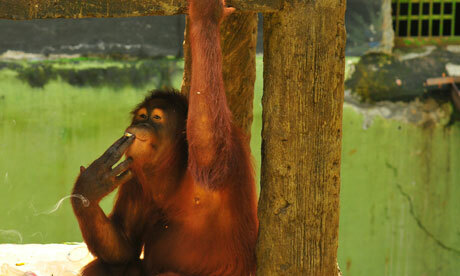 (Indonesian zoo aims to stub out orangutan’s smoking habit, Guardian). Wow. Two papers published in Nature Methods have outlined a new technique which allows researchers to track development of embryos (in this case Drosophila melanogaster), in real time. By taking simulataneous multi-view microscopic images of the developing embryo, individual cells can be tracked in real time. The methods are described in more detail at Nature News here. Have a look at the amazing results below, as a fruitfly embryo develops into a larva, ready to hatch. The two views are the dorsal (upper side) and ventral (lower side) view of the same embryo. See if you can pick a cell and watch its path of development. Think about how this links to IB Biology topics of cell division, cell specialisation and embryonic development. How does a stem cell know what type of cell to become? If you look closely, there’s a scale bar in the bottom-right. Take a snapshot and calculate the actual length of the embryo. For more reasons to love fruit flies, check out my mini-review of Fly: An Experimental Life by Martin Brookes. 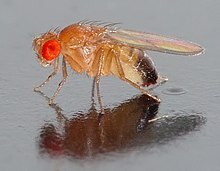 Image source: Drosophila melanogaster, from Wikipedia. This is the kind of content that would be useful as a flipped lesson on TED-ED. Biology Crash Course | Entertaining 12-min Bio brain dumps! CrashCourse Biology is a new(ish) and definitely more entertaining and engaging alternative to Khan Academy. Hank Green follows his brother John’s example (World History) and is producing some pretty funny, fast-paced and visual presentations for key concepts in Biology. One feature I like is the short ‘history of the idea‘ section in each video. Another feature I like is that the video description has links to sections within the video, making review easier. He also includes a set of citations (more like links to follow to find out more). So although they can be embedded, you are much better off watching them on his channel. Hank also has another channel, SciShow, which has short, sharp videos on science – whatever the topic. Here are a couple of examples from his playlist. I first heard about these channels via Fractus Learning, but didn’t get a chance to look until this weekend, searching for periodic table resources and Lewis Dots. When Crash Course popped up again, I figured it was time to have a look.